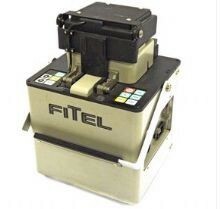 A high-precision fusion splicer for singlemode fiber and multimode fiber. The core of each fiber is viewed dirctly ensuring accurate alignment of fibers. The lightweight, compact design makes the splicer easily transport for field use. The S174H automatically measures the core/clad offset, aligns and splices the fibers, and then estimates the splice loss. The TV monitor displays operational information and the fusion splice process. Splicing parameters for 30 types of fibers can be stored. Data from a hundread splices can be stored in memory. A heater with an air-cooling fan is built in . This reduces the splice reinforcement time, compared with conventional product. A short exess length is required for splicing due to the heater location. An electrical discharging circuit with sophisticated correction ensures stable fusion splicing even in high altitudes.